Hi, all! PJ here. I am giddy with delight to welcome Anne Gracie back to The Romance Dish today. Not only is she one of my favorite people but when Anne comes visiting, it usually means we have a new book to read...and a new Anne Gracie book is always cause for celebration! 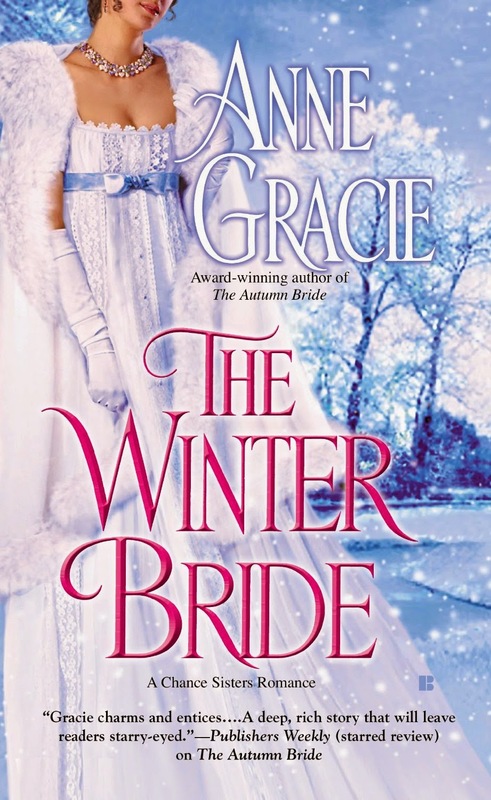 Today, we not only celebrate the release of the second book in Anne's Chance Sisters series, The Winter Bride but also the fact that the first book in the series, The Autumn Bride has just been named a 2014 Romance Writers of America RITA® finalist. Congratulations, Anne! The Autumn Bride was high on my Best of 2013 book list and The Winter Bride has secured a place for itself on my Best of 2014. If you're not reading this terrific series yet, I highly recommend you start now. 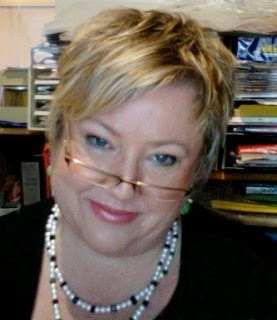 To learn more about Anne and her books, visit her website and connect with her online at Facebook and Twitter. The Winter Bride is the story of two marriage averse people. The heroine, Damaris, knows marriage is not always kind to women, but I won't say any more -- no spoilers here. My hero Freddy is a charming bad-boy rake, frivolous and lighthearted, with no intention of getting married for years. Unfortunately he's pursued by muffins. Yes, muffins. Freddy is pursued, even harassed by muffins, though not the edible cakey kind. In Freddy's own words, muffins are "Females. Eligible females. Seriously marriage-minded eligible females, usually of the reforming type." As sole heir to his father's title and fortune, not to mention his own private fortune, he'd been a target for match-making mamas and daughters since he'd first appeared in society. From the beginning he'd made it clear he had no interest in marriage, and once he realized respectable mamas and daughters avoided rakes like the plague, he'd done his best to encourage his reputation as a rake to grow. But in the last year or so his mother had apparently informed the mothers, aunts and grandmothers of every eligible female in the kingdom that he was contemplating marriage —she might as well have put a notice in The Gazette, curse her!—and as a result, wherever he went, muffins popped out of the woodwork. He wasn't contemplating marriage, dammit! Not with anything other than horror. "Not the literary society. The horror stories those girls read are enough to make a fellow's hair stand on end." Max frowned. "Horror stories? They don't read horror stories, only entertaining tales of the kind ladies seem to enjoy, about girls and gossip and families—"
"Horror stories, every last one of them," Freddy said firmly. "You asked me to sit in on their literary society last month, when you went up to Manchester, remember? The story they were reading then. . ." He gave an eloquent shudder. "Horror from the very first line: 'It is a truth universally acknowledged that a single man in possession of a large fortune must be in want of a wife.' Must he, indeed? What about the poor fellow's wants, eh? Do they matter? No. Every female in the blasted story was plotting to hook some man for herself or her daughter or niece. If you don't call that horror, I don't know what is! " "You can laugh, bound as you are for parson's noose in the morning," Freddy said bitterly, "but every single man in that story ended up married by the end of the book! Every last one." He numbered them off on his fingers. "The main fellow, his best friend, the parson, even the soldier fellow ended up married to the silly light-skirt sister — not one single man in that story escaped unwed." He shuddered again. "Enough to give a man nightmares. So no literary society for me, thank you." Of course, Max extracts the promise from him anyway, and Freddy is thrown into the company of a young lady who he discovers is just as opposed to marriage as he is, though for very different reasons. He thinks Damaris is the solution to all his muffin problems; she thinks a faux betrothal will get her the little country cottage she wants. But the course of pretend love never does run smooth. I loved writing Freddy and Damaris's story. When I was writing the Autumn Bride, I wasn't sure Freddy would really be hero material—he was very much a minor character, a fun, light entertaining rattle. But he surprised me; in The Winter Bride he slowly changed from a frivolous rake into a hero -- a beta hero but still, quite swoon-worthy. I hope you come to love him as much as I do. Here's a question for readers — if you had your own literary society, what book would you read first, and what would you serve as refreshments? I'll give a copy of The Winter Bride to someone who leaves a comment. First of all, congratulations to Anne for being nameed a RITA finalist. If I had my own literary society, I would read THE WINTER BRIDE first. I would serve little finger sandwices, cookies, and tea. The Winter Bride would be an excellent choice, Cathy. I enjoyed it so much! Thanks, Cathy, it's a thrill to final in the RITA. Love your choice of book—thank you — and I adore finger sandwiches -- yummy and elegant. Congratulations on being named a finalist. I'd choose BLEAK HOUSE by Charles Dickens. There is something for everyone there including romance, intrigue & a case of spontaneous combustion. I would NOT be serving muffins. There would be tea & little morsels of delight. You know, Mary, I've never read Bleak House. Jumped over to Amazon and it's currently FREE for kindle. Have downloaded. Thanks! Alcott is definitely a classic, and I wouldn't argue with your taste in the least -- all lovely. And I do agree about dips -- yummy in their place, which is not in the vicinity of books. Congratulations on the RITA nod, Anne. I'm with PJ: The Autumn Bride was on my Best of 2013 list, and I've added The Winter Bride to my Best of list for this year. I love Freddy! I'm always delighted to find a new beta hero. There are too few for my tastes. I'm still sighing over that perfect wedding gift. I think my literary society would start with Heyer--probably Frederica, The Grand Sophy, or The Unknown Ajax. And since I'm Southern to the core, along with tea, iced and hot, I'd serve finger sandwiches (chicken salad, pimento cheese, and cucumber) and tea cakes, lemon-drop cookies, mini-pecan pies and mini-scones (brown sugar-pecan and chocolate-cherry). And since I'm Southern to the core, along with tea, iced and hot, I'd serve finger sandwiches (chicken salad, pimento cheese, and cucumber) and tea cakes, lemon-drop cookies, mini-pecan pies and mini-scones (brown sugar-pecan and chocolate-cherry). Confession time: I have not read Georgette Heyer book and am really wanting a good one to read before spending the money to buy one. Not cheap, but just don't want to pay $12 for a Kindle edition. I'm going to Janga's house, with you, PJ -- love the choice of books — not enough people have read Heyer - she's a total delight! And the food sounds fabulous. Deb, the Heyers Janga listed are all fab, I also love Venetia (so romantic and funny with a bad-boy hero) I love plenty more, but don't want to confuse you with too many choices. Deb, if you keep an eye on the Dishes' sales announcements, I'm sure you will spot some of Heyer's books on sale. I bought a dozen or so a few months ago for $1.99 each. I hope to get the full collection at that price eventually. We'd read Harper Lee's To Kill a Mockingbird and munch on Southern favorites--chicken salad and shrimp sandwiches, iced tea, pecan pie and pralines. Thanks for a fun post. Excellent choice! I love that book and it's a great conversation starter. Love To Kill a Mockingbird — great choice for a book club. I taught it to just about every year 10 class I had and there's so much to talk about. And your choice of food sounds yummy, too. For my literary society, we'd start with Jane Austen's Pride and Prejudice. I'd serve tea and coffee with dessert, maybe a Hummingbird cake or red velvet cupcakes (my specialties). Oh, I love Hummingbird cake. I haven't had that in years! Hummingbird Cake has bananas, pineapple and pecans and the original recipe was published in Southern Living in the late 70s. I use this updated version: http://www.myrecipes.com/recipe/hummingbird-bundt-cake-50400000119141/ and rarely have leftovers. For Red Velvet cupcakes, I buy Duncan Hines mix and make decadent cream cheese frosting. This is coming in the mail to me today (pre-ordered and I love it when Amazon ships it to arrive the day of) and I can't wait! Oh, Freddy, I don't blame him. Marriage is a horror...with the wrong person. Literary society? We'd read...the Harry Potter series and discuss in great length about how tragic a character Professor Snape is. We'd eat Fizzing Whizzbees and drink Butterbeer. And maybe some other British staples, like sandwiches or something. Hi MsHellion -- love the Harry Potter books. Fizzing Whizzbees and Butterbeer -- wow! Thanks for ordering The Winter Bride. I hope you enjoy it. Congratulations and best wishes Anne. The Literary Society would read Wuthering Heights and our repast would consist of smoked salmon sandwiches, trifle and wonderful teas. Thanks for the good wishes, traveler - much appreciated. I adore smoked salmon sandwiches, and I make a pretty mean trifle myself, so it sounds like a lovely literary society. You know, I haven't included much in my books about the refreshments served at Lady Beatrice's literary society in my books-- apart from tea (which is often sherry in teacups) — maybe I should. Our choice of book would be Rebecca. Memorable and unforgettable. Tempting goodies - scones, brownies, and assorted and delectable teas. I first read Rebecca as a teenager and remember being utterly fascinated by it. Add some blueberry scones to make it a lovely afternoon. I'm the same -- I read Rebecca as a teenager. To be honest I don't remember it in detail, though I have it here on my shelves. Might be time for a reared — thank you. PJ, I make almond and blueberry friands (like little muffins only with ground almonds) which are light and lovely. I blogged about them on Friday with Cathryn Hein. I just wanted to say I love your books. I already have a copy of Winter Bride so no need to include me in the drawing. I hope you'll enjoy The Winter Bride as much as I did, jcp! Thanks so much jcp -- I hope you enjoy it. I'll keep you in the draw, though, and if your name pops up I'll send you something different. There are so many good books out there, yours included, it would be very difficult to select one. I think we would have to write titles down we agreed upon, put them in a hat, and draw out the months selection. Of course, we would have to add to the hat monthly with all the great new books coming out. I have a great recipe for a chocolate punch (alcohol included) that is decadent. I would serve that with tea as an option, a fruit plate, shortbread, English Toffee Bars (a cookie recipe I have and love), plus a cheese ball (I have a favorite recipe for one) with crackers. The book discussion could get rather interesting after a few cups of the punch. It drinks like a chocolate shake and the alcohol sneaks up on you. Excellent idea, Pat! I'm fascinated by the idea of your chocolate punch. I've never had anything like that. Do you have a recipe you'd be willing to share? Wow Library Pat, with refreshments like that there would be a fabulously lively discussion, I'm sure. ;) Would love your recipe for the chocolate punch and the cheese ball. Though I'm dieting at the moment and had better stick to the fresh fruit! I cannot find the punch recipe. I am hoping one of my daughters borrowed it. One of my favorite cookbooks is also missing. It is one of those self- published organization ones. It was from an AF base Officers' Wives Club. It was a great group of women and there were several gourmet cooks in our group. I use that one the most and can't find it. I am hoping it is buried in my overflowing cookbook bookcases. The cheese ball recipe is from a friend and in that book. If I ever find it, I will pass it along. Another good punch recipe I have served at showers, weddings, and women's club functions is Champagne Punch. It is light and refreshing, and also sneaks up on you. I often use pink champagne because it makes the punch look so nice. Best of all, it is really easy. Mix chilled contents. Serve from punch bowl. Use a decorated ring mold of ice with fruit (or flowers) to keep the punch cold. I do remember the cheese ball has cream cheese, shredded cheddar cheese, seasoned salt, finely diced green peppers and onions, and chopped pecans. You use about half the pecans mixed into the other ingredients, and use the rest to coat the outside when you roll it into a ball. Chill and serve with crackers. I will be looking for the recipe. My daughters may have it because it is a family favorite. Thanks Pat -- this looks fabulous -- the punch and the cheese ball. As for the missing recipe book — isn't that the way? Good books always "walk", I find. But thank you for sharing. Congratulations and what a gorgeous cover. It probably should be a classic like A Tale of Two Cities but I think I'd like something more modern like Clan of the Cave Bear lol. Tea and scones sound nice and proper but I'd rather have wine and finger foods. A Tale of Two cities -- such a sad ending. Clan of the cave bear is a great idea. I came across it years ago when I was backpacking and it was on a shelf in the B&B I was staying in. I stayed there an extra night so I could finish it. I love the idea of you spending an extra night at a B&B in order to finish reading a book. I think we can all relate to that! Not sure about an Anne Gracie week ;) -- I like a bit of variety. But it's a nice idea, each member choosing a fave author. I think one of the benefits of a book club or literary society for me would be to find new-to-me authors I loved. 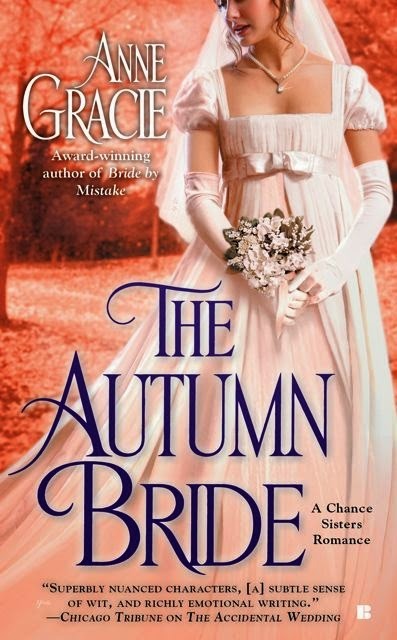 The Autumn Bride was such a good book and am looking forward to TWB. I might have my literary group read The Book Thief first. Not a romance by any means, but a compelling book. Wow. I gave it 5 stars on amazon.com. Food would include coffee, hot tea, punch and my gram's favorite dessert (and what the Presbyterian Ladies made for all luncheons). We called it Presbyterian Dessert.... ;) Crescent cookie crust, instant pudding mixed with cool whip (chocolate is best, but butterscotch is good, too), topped with cool whip and shaved chocolate or crushed candy bars. Thanks, Deb — I hope you enjoy the Winter Bride as much as you did the Autumn Bride. That dessert sounds amazing. I think any dessert that becomes popular with church groups is bound to be a classic. Erin, I highly recommend both The Autumn Bride and The Winter Bride. They are such wonderful stories! Aha, a practical woman, Erin — why waste time cooking when there are books to be read? If your name pops up in the draw, I'll send you a copy of the Autumn Bride, if you like. Welcome, Anne! First, let me say that I think the cover for TWB is GORGEOUS. I look forward to seeing the future covers. Second, I like both Laura L's and Hellie's answers: Pride and Prejudice and the Harry Potter books. Wow, what a book club that would be! And LOL to what Hellie would serve! Ah, you're a gel after Lady Beatrice's heart -- she serves sherry with her tea. And tea cakes would be perfect. The Autumn Bride would be the book I choose. I would probably serve maybe a veggie tray, fruit tray and small sandwiches. The Autumn Bride is such a good book. It would be a fun discussion! Congrats to Anne on her new book.. I would have my group read The Autumn Bride and I would make finger sandwiches.. My mother and grandmother would make these for all the bridal or baby showers the would give..My favorite ones the pinwheel ones that they would do do with creme cheese. They would use food colouring in the creme cheese.. They looked so elegant on one of my grandmother's silver serving trays.. Of course the Silver Tea service would come out too, along with the China cups and saucers. Thanks Kathleen, finger sandwiches sound lovely, though I don't think I've ever had pinwheel ones as you describe. We have asparagus rolls though, which are pretty yummy. My mother had a silver tea service, too, and it was always my job to polish it. I gave it away after she died, but my sisters and I have her lovely, elegant cup, saucer and plate sets. I must have an afternoon gathering of friends and use them one day. Thanks so much for joining us today, Anne. You've had a busy release day! I hope copies of The Winter Bride are flying off the shelves. It's a wonderful book! Thanks so much, PJ — sorry to arrive late to the party -- I was sleeping. Our night is your day. I really appreciate your having me to visit. It's been lovely. And now I'm up, I'm here and ready for any more comments. If I had a circle of friends to start a literary society, the first book would be Don Quixote by Cervantes. I'm sure some of your followers might be saying "who is that?" but in my mind Cervantes is the author who was the first to entice he's readers with historical romance. After he gave us a hero in Don Quixote who saw only the good in poor "Dulcinea" who was any but that "perfect heroine"! Wouldn't it it be wonderful if everyone only saw what good we might have and be able to not look to deeply to see all our flaws! Fortunately my husband isn't that different from Don and for 44 years has seen I am inside and has shared with me "The Impossible Dream! for 44 years! Jeanne, Cervantes is a wonderful choice — and yes, some people won't know him. In classes these days I find people have never read Dickens, either, and I read somewhere a lot of the young women who say Pride and Prejudice is their favorite book haven't actually read it, but love the story because of the movies and TV adaptations. Congratulations on your 44 years together. Janice, I love this idea. I think romance has changed a lot over the years, but some of my all time faves are some of the older ones. I've been rereading some of them. I think it would be hard to compare them just as samples from different times, though, as a lot of the difference would be accounted for by author voice as much as time. It occurs to me it might also be interesting to compare the style of authors who've been publishing consistently for 20 years or more. Great idea. Thanks for suggesting it. I would choose to read Eloisa James' new book Three Weeks with Lady X and I'd serve tea and yummy cupcakes. I am so looking forward to reading Three Weeks with Lady X — I have it on order. And tea and cupcakes sounds perfect. I'd have to choose The Autumn Bride and the next book would be The Winter Bride. I like following series and you can't go wrong with Anne's books! I'd serve autumn themed foods: cider, pumpkin scones and carrot cupcakes with cream cheese frosting. Thanks, Marcy, lovely of you to suggest them. I like the sound of your seasonal refreshments, too. Yum yum. I would read Pride & Prejudice again. Every time I read it or listen to it, I notice something new. Food? Tea and cucumber sandwiches. Probably watercress, too. Maybe cute little chicken, tuna, or egg salad sandwiches. Crumpets. English muffins. Cupcakes. Yum! Hi Linnea — you can't go wrong with P&P. And what a lovely spread. This morning (because it's a chilly morning here) I'm going for the crumpets and toasted English muffins. Delish. If I had my own literary society, I would choose to read the Nora Roberts' book Dark Witch, which is the first book in her new trilogy set in Ireland. To keep with the Irish theme, I would serve Irish Stew and soda bread. That sounds like an excellent choice, Cheryl. I love Nora's Irish books. (Love a lot of her books, actually — am currently rereading her Chesapeake bay series.) Irish stew and soda bread sounds just the ticket. Well, cheesecake would be the snack of choice. Hard to narrow down a book choice, but let's go with Emma by Jane Austin. And can we watch the movie, too? Love that Jeremy Northam! Definitely we can watch the movie, too, Sharlene — I think it's fun comparing the movie with the book and talking about the choices the scriptwriters made. And Jeremy Northam, most definitely! I thought that one followed the book pretty accurately. Hello Di — I think that sounds like a good recipe for a fun evening. Wine always helps the discussion (and laughter) along. Thanks for popping by. I'd start with A Tree Grows in Brooklyn and serve tea...hot with lemon and sugar....tiny scones, pecan and bllueberry.